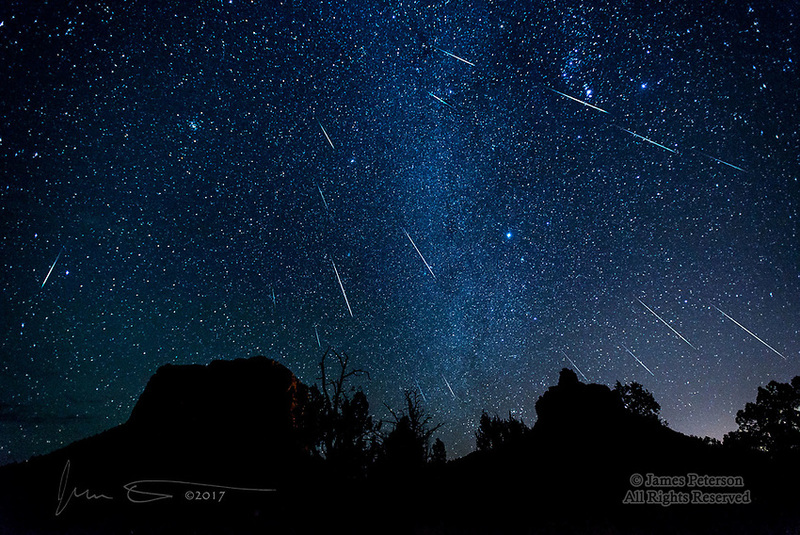 Geminid Meteor Shower, December 2017 ©2017 James D Peterson. They predicted that this meteor shower would be good this year, and it seems they knew what they were talking about. This was the view from the Courthouse Vista trailhead near Sedona, Arizona, in the Coconino National Forest (not far from where I live). I captured these 18 meteors in about 1.5 hours, starting about 11:15PM on Dec. 13. (I saw many others that were outside the field of view of my lens - they appeared all over the sky.) I've been trying for years to capture enough of a meteor shower to make a good composite photo, and everything finally came together this time. In the foreground, Courthouse Butte is on the left and Bell Rock is on the right.